Lorne Shirinian’s new collection of stories explores, in part, the lives of deportees and refugees from war zones who find themselves at a physical and metaphorical border. Some hope to cross that precarious zone, which offers escape and the possibility of a better life; however, getting across entails a cost, and what awaits them on the other side is unknown. 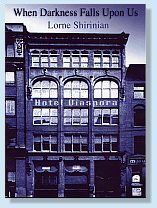 Others have already gone over and now find themselves at the holding place in their new city, the Hotel Diaspora, where they attempt to repair their damaged lives. The final story, In a Dark Light, is a novella about a fifty-eight year old writer with a checkered past who after years of anonymity suddenly finds success after his mystery novel becomes a best seller. While on a reading tour of Southern Ontario, he comes face to face with his past and his family history, which he has tried to forget, yet must now confront. These powerful stories are told in the form of a confession. Shirinian’s writing has gained a growing readership, which will not be disappointed in this new collection. The story, “Nothing Today; Try Again Tomorrow,” in the collection was short-listed for the CBC Literary Awards in 2005.